Of course, most of us want to live in pleasant, not to say “beautiful,” surroundings. We often think in terms of colors, patterns, schemes, shades, and so on. Many people are so concentrated on form when they think of home design that they all but forget function. I can’t afford that luxury. The look of a product is certainly one factor influencing my purchasing decisions; however, I also factor in simplicity of use, ease of use, the cost versus benefit of the product, ease of maintenance, and durability. Since I use a wheelchair for mobility, I am most interested in products that are designed to make life easier from a seated position. Items such as a side-hinged oven, and a front-loading washer and dryer make access easier. This is not to say that I totally ignore form. When I look at the product for design attributes, I look at the overall attractiveness of the product as well as to what extent it will complement, coordinate, or contrast with other products selected for the home. For example, the visual feel for our home will be contemporary. We will be using many natural stone, tile, wood, and glass products throughout. Our interior designer, Anna Lyon, is well trained and has developed an eye for what colors, finishes and textures work well together. Color plays a big part in influencing our decisions. Some colors resonate more strongly, others fade from favor due to the psychological effect they have on us. We each have our own personal style and want to surround ourselves in our homes with products that make us feel good, and help us in our daily living. 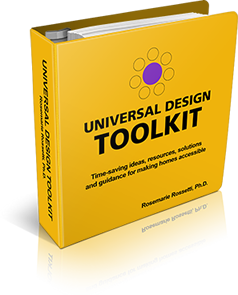 Universal design products need not look like they are designed for people with disabilities or for use in hospitals. For example, there are beautiful stylish and safe grab bars, and towel bars that can double as grab bars, by Great Grabz (www.greatgrabz.com). 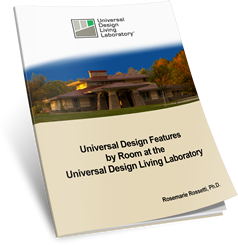 Some builders who are unfamiliar with universal design often tell their customers who use wheelchairs that they can modify an existing floor plan and make product changes to better meet their customer’s individual needs. After touring many new homes, I found that serious mistakes were made in the space design as well as product selection. One such mistake was in a home my husband and I visited in Columbus, Ohio. The no-threshold, tile roll-in shower was spacious and outfitted with many grab bars. It contained a hand held shower nozzle on a vertical bar, and a tile transfer bench at the shower entry. When I first saw this shower, I made sure my husband took pictures so we could design a similar shower. Then the homeowner told me that she was not able to use this bench because it was slippery when wet! She had to purchase a four-wheeled shower chair that she stored in the bathroom in order to safely take a shower. This is not what she originally had in mind. She had a beautiful shower that lacked function. This is something each of us needs to avoid in the planning process. In this same home, the builder installed the kitchen sink in a corner and the dishwasher to the right of the sink. At first glance, the arrangement looked fine. But when I rolled under the sink, I found that there was a lack of space for my knees, and I couldn’t roll close enough to the sink. Not only was this a design flaw, but I couldn’t open the dishwasher! By positioning my wheelchair at the sink, I was blocking the dishwasher door. Planning is crucial when it comes to new home construction and remodeling, especially in high functioning areas like the kitchen and bath. A home designed for a person who uses a wheelchair must be done by specialists with experience. The National Association of Home Builders (www.nahb.org) has a certification program for remodelers, the Certified Aging-in-Place Specialist (CAPS). You can search a Web- based directory to find a specialist in your area. This should help you find a person that better understands how homes need to be built for ease of use, especially as spaces become limiting in a wheelchair. The American Society of Interior Designers (www.asid.org) offers an on-line designer referral service that you can search based on your location. These members can help you solve problems, avoid costly mistakes, and create a space that is attractive and functional. In the end, a functional home is one that is designed with the occupants in mind, taking a look at their existing capabilities as well as projecting future limitations. Money is well spent on careful consideration and thoughtful detail in the construction plans to guide the builder during the construction process.